Republican Senator John Thune (left) and Democratic Senator Ed Markey in October. There’s new resolve in Congress to crack down on attempted phone scams, with the support of phone companies, which are independently implementing new technologies to stop them. 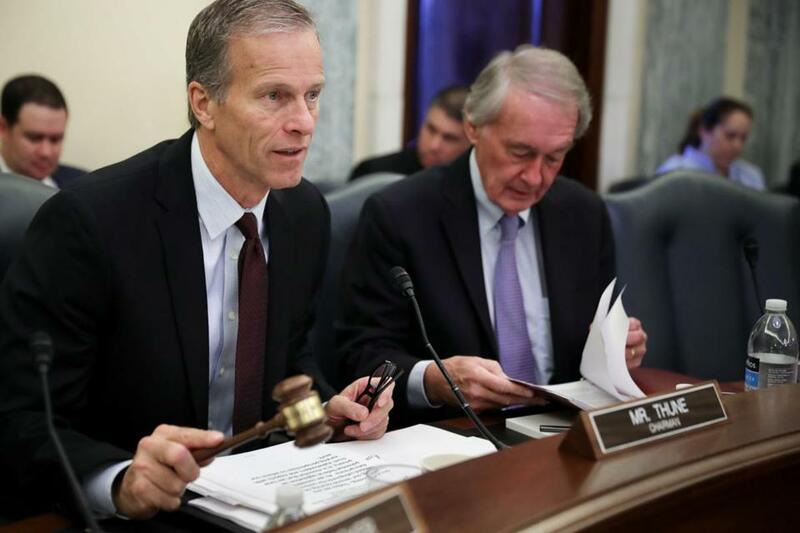 In a rare moment of bipartisanship this month, US Senator Edward J. Markey of Massachusetts joined Senator John Thune, a South Dakota Republican, to sponsor a bill that would make it easier for the Federal Communications Commission to levy $10,000 fines against people caught making unwanted robocalls. The measure would also order phone companies to take steps to contain the activity. Markey, as a member of the House, played a leading role in the passage of the Telephone Consumer Protection Act, which in 1991 banned unsolicited robocalls. But the law has not aged well as cellphones have proliferated, and the nation’s telephone infrastructure has undergone dramatic changes. “We need to . . . make sure that we are keeping pace with the fraudsters, keeping pace with those who are not abiding by the law,” Markey said in an interview. There were an estimated 5.1 billion robocalls placed nationwide in October, according to YouMail, a company that offers automated robocall blocking. YouMail said the number was the largest it had ever tallied. In Massachusetts, the organization calculated 53 million calls last month. Alex Quilici, chief executive of YouMail, said as many as 60 percent of the calls are either scams or unwanted telemarketing offers. The scale of the problem is putting increasing pressure on both policy makers and telecommunications companies to take action. Markey and Thune’s proposal has gotten a warm reception from industry interests, including Verizon, as well as advocates such as Consumer Reports, all of whom say they believe it would make a difference. FCC chairman Ajit Pai has also praised the measure. But fighting robocalls has proved a difficult technical challenge. There are tools available for both customers and phone companies to block calls from unwanted numbers and organizations, but many robocallers have found ways to “spoof” calls, making it hard for the receiver to know where the call truly originated. The problem emerged after phone companies broadly adopted “voice over Internet protocol” systems, whose design makes it easier for callers to conceal their true numbers. That’s why many of the unwanted calls that come to your phone often appear on your caller ID with a phone number that looks like it’s from your neighborhood — sometimes even sharing the first three digits of your number. Phone companies have been working on a way to put a stop to spoofing, concerned that the proliferation of robocalls is undermining confidence in the phone system. “If you don’t trust the network, users will use it less, and enterprises will use it less as a channel to their customers, and all of that’s going to hurt the phone companies,” said Jim McEachern, principal technologist for the Alliance for Telecommunications Industry Solutions, an industry group that has been working on the issue. Soon, McEachern said, telecommunications companies are likely to adopt a technological fix known as SHAKEN. (James Bond fans will enjoy the fact that it runs on a protocol known as STIR.) The changes will make it much harder for robocallers to put false information into your caller ID without detection. If phone companies voluntarily adopt the technology, it could make a big difference, even without the passage of a bill. But Markey and Thune’s initiative would make it mandatory for service providers to adopt SHAKEN or something like it. There have been efforts to punish robocallers for as long as they have been annoying — and scamming — phone customers. But aggressive enforcement efforts have frequently met with opposition from businesses such as debt collectors and loan servicers, who worry about being ensnared for infractions such as sending legitimate robocalls to a wrong number. A debt collection industry group this year successfully sued in federal court to throw out FCC rules broadening the liability of businesses accused of making robocalls. Many have argued that outdated laws are leading to unfair judgments against organizations that have no intention of running scams. And groups including the US Chamber of Commerce have been calling for new laws that take into account the past three decades of change in the telecommunications business. There are other signs of progress. The FCC recently proposed one measure that would make it easier for callers to find out when their customers’ numbers have changed, so it’s less likely they’ll be bothering the wrong person, and another that would make it easier to block text messages. On the legislative front, the next Congress could have powerful advocates for reform in both chambers. Thune is chairman of the Senate Commerce, Science, and Transportation Committee. And as Democrats take control of the House, a major voice against robocalls in that chamber is likely to gain influence. New Jersey Representative Frank Pallone Jr., now the ranking Democratic member of the House Energy and Commerce Committee, has backed several bills seeking to tighten enforcement, though he has not weighed in on the latest Senate bill. The problems have frustrated Markey as they have worsened over the years. He’s been known to pick up spam calls to his office, just to see what he can find out about who placed them. Markey said he learned the poem in grade school. It has stuck in his mind as an illustration of the value of people’s time.